Join us for coffee and tea following worship service on Sunday mornings, and ask our members why they love being part of our liberal religious community. 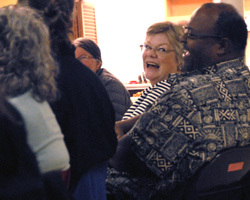 You might hear stories of how our community has provided a supporting environment for exploring one’s personal understanding of meaning in the world, how their children love our Religious Exploration programs, how they discovered a new concept in an Adult Religious Exploration class, or how we volunteer together throughout our community. We hold Pathways to Membership classes three times a year on Saturday mornings where you can learn more about joining us as a member. Our classes include an overview of the history of Unitarian Universalism, the history of our congregation, and information about how to connect with programs and volunteer opportunities. These classes also provide you an opportunity to meet other newcomers, along with members who have joined recently, and with members who have been part of our community for several years. If you would like to attend one of our Pathways to Membership classes, please contact the church office for more information at Admin@TahomaUU.com or by phone at 253-474-4646.